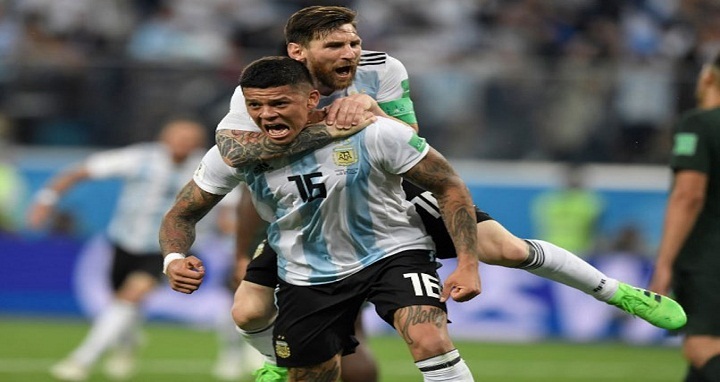 Dhaka, 30 June, Abnews: Argentina are looking to put their tricky World Cup start behind them against 1998 winners France in the last 16 on Saturday. A 1-1 draw with minnows Iceland and a humbling 3-0 defeat to Croatia left the 2014 finalists on the verge of elimination, but a 2-1 win over Nigeria saw Argentina through in second place. Jorge Sampaoli's position was reportedly in doubt before that crucial Nigeria victory, but the Argentina coach is now looking forward to playing 1998 winners France in the last-16. "We are going to play against a team with great individual players," Sampaoli said. "They are among the very best contenders and we will need to be very consistent to come out on top of a very difficult match." After Argentina's victory over Nigeria, Sampaoli headed to the dressing room without celebrating alongside his players, but Lionel Messi went over to hug his coach before he departed in a show of unity with the under-fire manager. "Leo's gesture with me makes me proud. He knows all the passion I put into everything I do," Sampaoli said. "We share the dream of coming to Russia to achieve something important for Argentina." Much has been made of Messi's influence on the Argentina side, but France goalkeeper Hugo Lloris rejected suggestions they were a one-man outfit. He said: "There is so much expectation around Messi, which I think is normal, but still I think the Argentina team has a lot to show. "They have had difficult times and still have been able to qualify. I am sure they will feel like going much further in the competition, they have won the World Cup before. "This is going to be a big match, and a difficult one, we are going to have to step up our level." Benjamin Mendy will miss out for France through injury, having come off the bench in their dead rubber with Denmark last time out. There are no new concerns for Argentina, who could name the same side that beat Nigeria to qualify for the last-16. France: Lloris, Sidibe, Umtiti, Varane, Hernandez, Pogba, Kante, Mbappe, Griezmann, Matuidi, Giroud.